It’s no wonder that some people have described this year as a giant dumpster fire. But I guess that I’m ever the optimist, and even in the face of an uncertain future I look forward to opportunities for changing ourselves for the better. It might not look like much in the grand scheme of things—I mean, what is learning how to crochet really going to do when there are animals on the brink of extinction?—but I believe in progress, even if progress happens to be tiny baby steps that are barely perceivable on a large scale. As long as you keep on moving, you’re still getting somewhere, as it were. Get politically active. If politics has been getting you down, do something about it! There have been stories about women becoming inspired to run for government following this year’s Presidential election, and there are several resources available for preparing women for the role. Organizations such as She Should Run, for instance, provide women with tools for political office. There’s also the Women’s March on Washington taking place next year on January 21 in DC. Support organizations that support you. If politics aren’t your thing, you can still lend your voice to resources that might resonate with you. 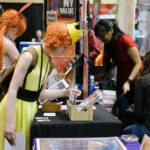 For example, if you’re reading this post, chances are that you might want to donate to or volunteer with GeekGirlCon in the future. Or, you might want to support our partners, such as the ACLU, Girl Scouts of Western Washington, All Cycles, or the Big Brained Superheroes Club. Be creative. Write, draw, sing, and play. December is also a great time to get inspired by craft fairs. The Urban Craft Uprising hosts a Winter Market in Westlake Park for another week. And, this weekend, Renegade Craft Fair is happening, as is Seattle’s Unique Boutique (if you’re 21+). There’s still plenty of time to learn to make holiday gifts, or give yourself the gift of a new crafty skill! If you’ve ever wanted to learn how to code, do it! There are a lot of good, free online sources for learning (or rather, teaching yourself) how to code. Two sites that I like using are Codecademy and Free Code Camp. The nice thing about the online sources is that you can learn at your own pace, and there are networks of other users who you can ask for help. Take time for self-care. There’s already plenty of stress in the world as it is, so make sure you take care of you. Read a book that you’ve always wanted to, or watch a favorite movie. Do something that makes you happy. Here’s to a brighter, braver new year. 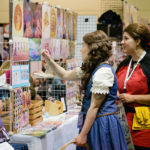 Be An Exhibitor For GGC ’19! Previously disguised as a college professor and family lawyer, JC Lau is an Australian video game journalist and writer living in Seattle.